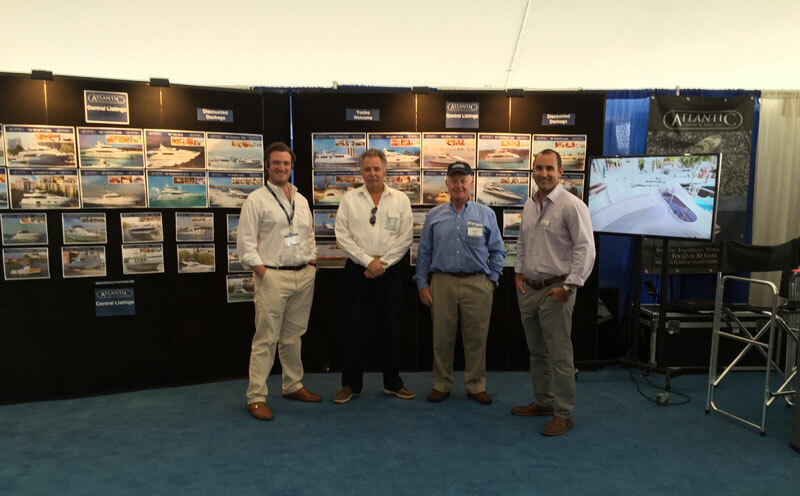 Day one at the Norwalk boat show : Atlantic Yacht & Ship, Inc.
Our brokers are ready to go with our new display at this year’s Norwalk Boat Show! Located at Norwalk Cove Marina, this boat show runs September 24-27 and will be open from 10 am to 6 pm daily. Atlantic Yacht & Ship will be on display at the 2015 Norwalk Boat Show and we will have brokers at the show representing current yachts for sale and meeting new clients. Admission is $15 at the gate but if you know you are coming you can buy tickets online in advance for a discount. Run by the same company the operates the New York Boat Show, this show proves to be a staple in the Northeast United States boat show circuit. From fishing to cruising to family fun there are boats for every lifestyle and budget. See and board the latest model boats— luxury yachts, sport fishers, cruisers, ski boats, sailboats, and more. Check out the latest in marine accessories, electronics, engines and fishing gear, too. It’s fall’s biggest boat sale—a once-a-year opportunity to compare makes and models, and gear up with the latest accessories all in one trip. For more information about the 2015 Norwalk Boat Show be sure to contact your Atlantic Yacht & Ship broker today!